Roasted Pumpkin on Toast is a healthy and delicious breakfast or brunch. The whole family will love this quick breakfast. Cut the pumpkin in half. Scoop out the seeds, reserving them if you would like to roast the seeds later. Cut each half of the pumpkin into about 6 slices. Bruch each slice with oil, and sprinkle on any spices or herbs, if using. Place the slices on a roasting tray with the skin side down. Roast for 30-40 minutes, until a fork can be easily inserted into the pumpkin flesh. Remove from the oven and allow to cool for 10 minutes. Carefully peel the skin off the slices. For each slice that you'll be using on the Roasted Pumpkin on Toast, cut the slice in half lengthwise. In a small frying pan, melt the butter on medium heat. Add in the pecans and toast, stirring frequently, for about 5 minutes, until the pecans are fragrant. Remove from heat. Spread the cream cheese evenly on top of the bread. Layer on the roasted pumpkin slices. Top with the toasted pecans, Generously drizzle maple syrup on top. Sprinkle on a dusting of cinnamon. Finish with a pinch of salt. You can find detailed directions on how to roast a pumpkin on The Kitchn. Store the left over roasted pumpkin in a covered container in the refrigerator. 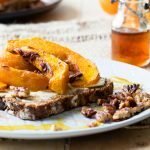 Get this recipe for Roasted Pumpkin on Toast at https://www.theworktop.com/breakfast-brunch-recipes/roasted-pumpkin-toast/.